Every now and again I will recommend a book to you, but very rarely will I do a full book review. Mostly that's because I'm short on time and this isn't a book-review blog. 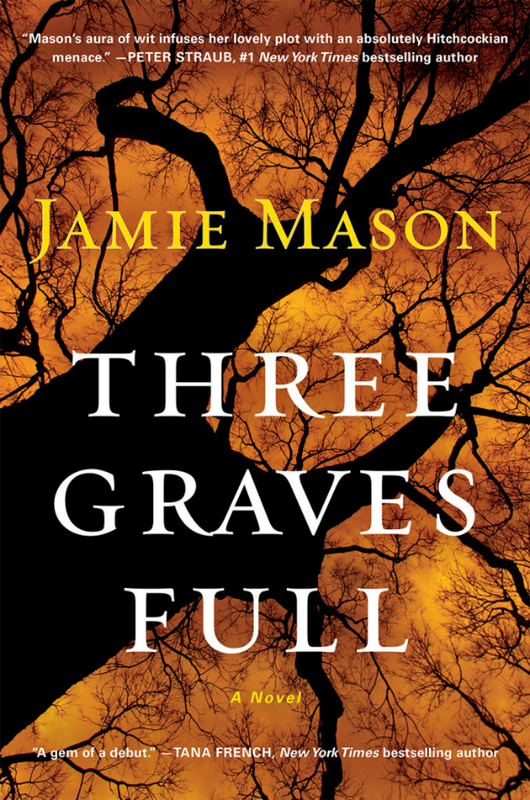 The book is THREE GRAVES FULL by Jamie Mason. For ease of reading, I'll divide this review into three sections: (1) story summary, (2) my review (3) disclaimer (I know that's not normal, but read on and you'll see). Before I begin, I'll let you know that this is one book that you can judge by its cover, which I just love. 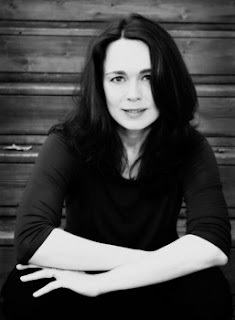 The story: I read a lot of crime fiction, and as you know I write it, too. Originality, true originality, is rare but we have it here. Once an author comes up with a unique premise like this, the reader is inevitably going to be hooked and I was. It's a clever double-hook, too, with Jason's body in the back yard and two unknown ones in the front--that's two mysteries that the reader wants to investigate. The characters: here's a challenge: write a story where the main character is a wimp. How do you hold the reader's interest when your central figure is kind of a passive, soft-spined, scaredy-cat? Well, you write this book. See, the other characters become extensions of him, moulding his mind and actions and pressing him into activities that create conflict, which is the essence of a good book. And those surrounding characters are themselves original, interesting, and real. The other thing that happens, is that you as the reader start to donate spine to the main man. I felt anger on behalf of Jason as one of the characters bullied him, and Jason's flaws let me root for him when I wasn't directly identifying with him. The writing: I probably should have started with this, because the writing was perhaps the greatest pleasure for me. This book has been billed as a kind of Coen brothers movie in book form. I happen to think that's an apt description because this book has a literary flair that elevates it above others in the genre. 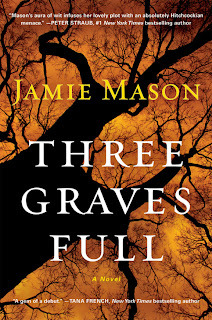 I've seen reviews calling THREE GRAVES FULL literary and I concur. Paragraph after paragraph, page after page, I reveled in the beauty of the language. Mason has a way with words that, as a writer, delights you and makes you envious, and as a reader is beyond charming. Think of a book as a meal, with the plot as the recipe, the characters as the ingredients, and the writing as the process of combining those two and cooking. Mason is a master chef. I know Jamie Mason. I offered to read and review her book because she's a friend. Understand, though, that such an offer trails behind it an invisible but very real ripple of trepidation. What if I hate the book? What do I do and say then? Well, I'll tell you: what I don't do in that case is write a long, slobbering review raving about it. I only do that when I love the book, which as you can tell happens to be the case. Now, I haven't said this to Jamie, though I know she's felt the same as a writer and reviewer, but about nine sentences in I experienced a huge wave of relief (and in this case excitement) when it became clear that she could really write. And believe me, she can really, really write. Oooh, you got me with "Coen brothers movie in book form." This is going on my list. I enjoy crime fiction too. John Grisham has always been a favorite. Looking forward to savoring Jamie Mason's prose.